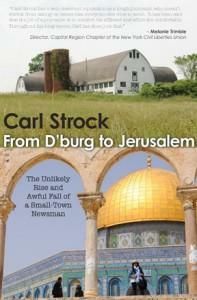 Carl Strock - "From D’burg To Jerusalem"
Carl Strock is a longtime columnist in the Capital District. His new book, From D’burg to Jerusalem chronicles the author's journalistic adventures from the most trivial - the painting of the town garage roof in Duanesburg - to the most far-reaching - religious nationalism in Jerusalem, visiting along the way police corruption, the power of teacher's unions, the sexual abuse of children, Christian fundamentalism, and more. These are the stories that Carl Strock explored in his newspaper column with a trajectory that goes up and up - until it suddenly goes down. His long career ended in controversy (even protests) last year over his writing following his trip to Jerusalem. Carl Strock worked in Vietman, Laous, and Hong Kong before landing in Schenectady, NY and launching the column "The View From Here" for The Daily Gazette.